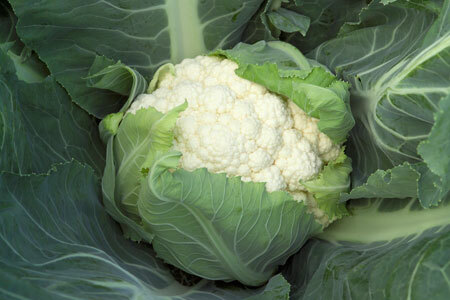 The word “cauliflower” comes from two Latin terms and literally means “cabbage flower”. It has been cultivated in Asia Minor and the Mediterranean for more than 2,000 years. Cauliflower is cool season crop and belongs to the cole crop family which includes broccoli, Brussels sprouts, cabbage, collards, kale, and kohlrabi. To some, cauliflower has an unearned reputation for being tricky to grow, but nothing could be further from the truth. The key to growing good cauliflower is to maintain a steady growth rate, consistently cool temperatures and never let the plant dry out between watering. The head, technically known as the “curd”, must be protected from the sun to remain snowy white. When the bud forms in the center of the plant, the outer leaves are gathered into a tent over the developing curd to shield it from the sunlight. 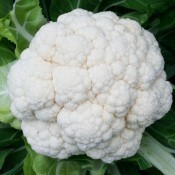 Cauliflower is an excellent companion plant to other cole crops, swiss chard, spinach, and tomatoes. Do not plant with strawberries. Like other members of the cabbage family, cauliflower is considered helpful in the prevention of certain kinds of cancer. It is a good source of vitamin C and potassium. One cup of cooked cauliflower contains 28 calories. Cut the stem below the head when the head is 6 – 8 inches (15 – 20 cm) in diameter. Cauliflower heads will keep fresh in the refrigerator for up to 2 weeks if they are stored in plastic bags. Outstanding late season variety that is worth the wait. Produces bright white heads that are heavy and have uniform dense curds.